I’ve always loved sesame snaps and these take it to a whole new level. 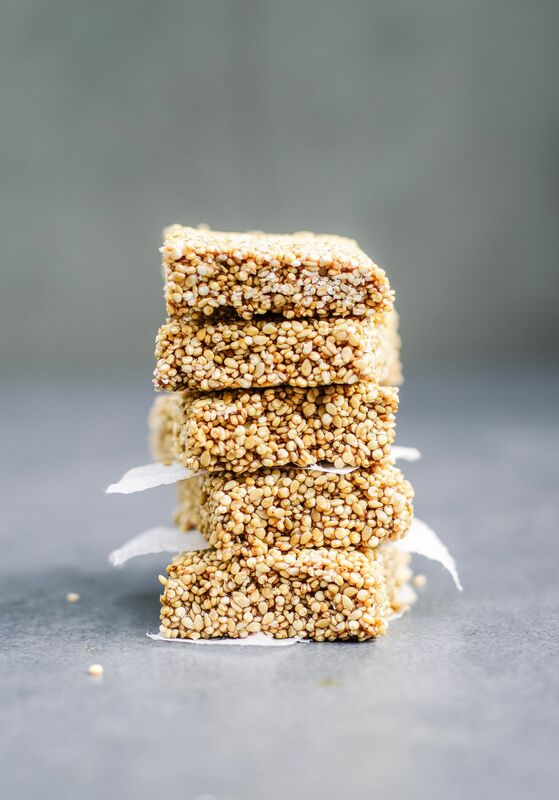 I add quinoa for a little more nuttiness and protein and mixed with the sesame seeds the texture is just gorgeous. Coconut sugar makes these perfectly sticky with the perfect amount of chew and snap. They’re ideal when you’re not quite sure what you’re in the mood for. Combine the quinoa and the sesame seeds and add them to a large pan on medium heat. At the same time, combine the honey and coconut sugar in a saucepan on medium heat. 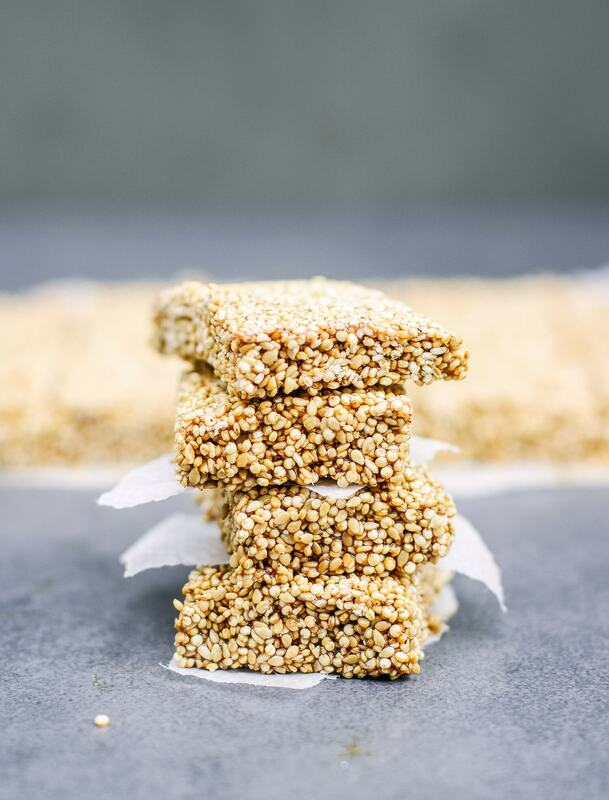 Cook the quinoa and sesame seeds for a few minutes, tossing regularly, letting the seeds turn a lovely golden colour. Let the honey and coconut sugar heat up until all the coconut sugar has melted and the mixture has thinned out into a runny caramel (about 3 minutes). Then stir in a good pinch of coarse salt and take it off the heat. Set it aside to cool for a few minutes. While that’s cooling, line an 8 inch baking tin with parchment paper. Then add the sesame seeds and quinoa to a large bowl and stir in the coconut sugar mixture. Press the mixture firmly into the tin, spreading it out evenly (I use the back of a wet spoon if it’s getting sticky). Pop them in the fridge to set for about an hour. Slice into bars. If you want to add chocolate, melt your chocolate and drizzle it over the bars. really liked the look of the quinoa sesame snaps but did i miss the list of ingredients and quantities? They look gorgeous. My fear would be I’d scoff the lot!! Hi just wondering is there any alternative that could be used instead of coconut sugar? Nut butter?? Have all ingredients except sugar!! These are genius! I used to eat sesame snaps all the time. These are like the upgraded version. Will definitely have to give them a go! These are delicious and just like the real thing. I found it very hard to flatten them into the tin. They kept sticking to my hands and spoon I was using so in the end I used the back of a spoon dipped in hot water and they spread out no problem! Love all your recipes. Just made the raspberry chia jam also??? ?